Bus from Kuantan to Melaka plays an important role in connecting people between two cities. One of the reasons for Kuantan residents to visit Malacca is because Malacca is such a charming destination to visit in Malaysia. It is full of historical sites, palatable Nyonya cuisine and the famous street night market, Jonker Street. 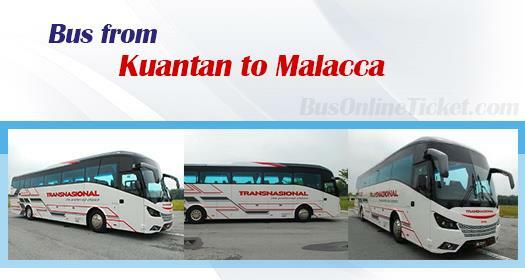 Transnasional is the only operator in the industry providing bus from Kuantan to Melaka. Transnasional is the national carrier under the management of government arm KTB group. Therefore, the departure is punctual and the service is reliable. Many locals have been taking their service since young. Transnasional provides only 3 daily departure from Kuantan Sentral Bus Terminal to Melaka Sentral Bus Terminal. The daily schedules are 1.00am, 8.30am and 1.30pm. The journey from Kuantan to Malacca takes about 4.5 hours, travelling about 373km. The duration could take longer depending on the traffic and climate conditions. The coach would have a stopover for passengers' toilet break because all coaches in Malaysia do not install with toilet facility. The bus fare for bus to Malacca from Kuantan is reasonable charged at RM 30.70 for adult and RM23.10 for child. Out of the 3 schedules, Transnasional deploys 30-seater VIP coach for midnight trip at 1.00am and afternoon trip 1.30pm. The trip at 830am is the 39-seater standard coach. Hence, passengers who prefer spacious VIP coach, need to select the correct schedule timing to avoid disappointment. Thinking of visiting Malacca soon? Please visit our online booking portal BusOnlineTicket.com to book your bus tickets. With the limited bus schedule availability, passengers are advised to book their bus tickets to secure their seats. You can book your bus tickets in anywhere, anytime, and anyplace now with just one click.